THE founding of Ashihara Karate in Singapore is attributed to one man- Vincent Shi. He was instructed by the late founder of the martial art himself, Ashihara Hideyuki, and was ultimately qualified as a yondan (forth degree black belt) by Ashihara Karate's global governing body- New International Karate Organization (NIKO). Today, Vincent stands among a handful of instructors internationally holding a yondan, a high grade in Ashihara Karate according to NIKO. 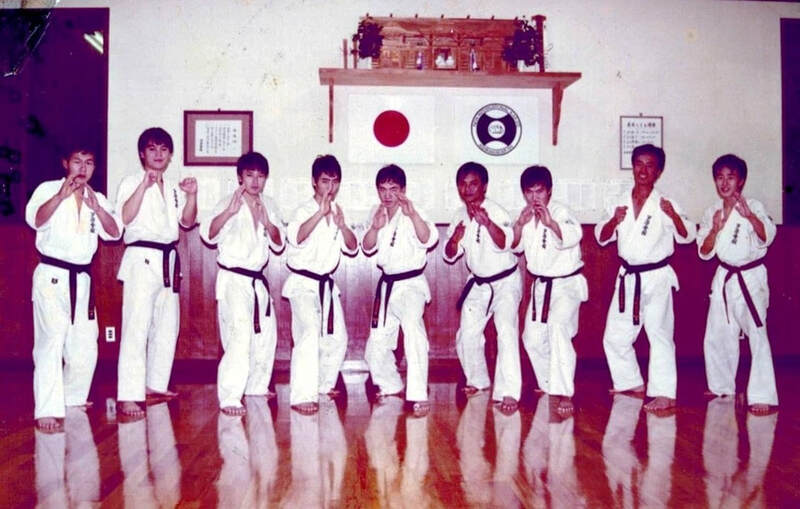 In 1970s Japan, a popular Japanese comic book kick-started huge interest in karate. Called Karate Baka Ichidai (The Karate Fool), it was inspired by real-life karate master Mas Oyama who played a huge role in karate's presence worldwide. The book also influenced Vincent, when he was a young boy. In fact, it introduced him not just to karate, but also to the Ashihara school, eventually leading to him founding Ashihara Karate Kaikan Singapore. Vincent started learning martial arts when he was nine years old. He picked up Hong Quan - a Shaolin style of Kung Fu- before taking up Kyokushin Karate in 1971, after a childhood friend persuaded him to learn the martial art together. While holding a nidan (second degree black belt) in Kyokushin Karate, Vincent moved to Japan to train as an uchi-deshi or live-in student at the Kyokushinkai headquarters in Ikebukuro, Tokyo. At that time, another student who was being tutored by Mas Oyama himself, had sneaked in a book that he kept hidden under his pillow. Vincent asked to read it, and it became clear why the student had to keep the text away from prying eyes. The book, Sasurai Karate (Vagabond Karate), was written by Ashihara Hideyuki, who talked about how he left the Kyokushin organization and founded his own school - Ashihara Karate Kaikan. ​Vincent remembered the author, who also starred in that comic book he read during his childhood days. In the comic, Ashihara Hideyuki was depicted as a disciple of Mas Oyama with a strong personality. “From that book (Sasurai Karate), I knew more about him (Ashihara Hideyuki). After that, I went to visit an Ashihara Kaikan dojo in Hiroshima" Vincent says. In Hiroshima, Vincent was impressed by the trademarks of Ashihara Karate- its use of positioning and footwork, and emphasis on realistic sparring techniques. When he returned to Singapore, Vincent decided it was time for a change. He wrote to Ashihara Hideyuki, the Kancho (organization chief) of Ashihara Kaikan at the time, and formally asked to join this “Vagabond’s” school of karate. He was holding a sandan (third degree black belt) under the Kyokushin organization when he left to join Ashihara Kaikan. There was no Ashihara dojo in Singapore when Vincent joined the organization in 1983. So, Ashihara Hideyuki-kancho asked one of his students who was based in Singapore, Matsumoto, to get in touch with him. Matsumoto invited Vincent to train with him and his son in their apartment. After that, Vincent visited the Ashihara Kaikan headquarters in Matsuyama, Japan, where he studied under the founder himself. Vincent remembers fondly the “culture shock” he experienced when the late Kancho took him under his wing. The founder of Ashihara also had a teaching style that was very different from what Vincent was used to in his former karate school. Vincent returned to Singapore in 1985 with the founder’s blessings to form a local dojo. He had to start from scratch and attract students through advertisements and banners. The first dojo was in Hotel Royal in Newton Road. Matsumoto, kancho's Singapore-based student who helped train Vincent in Ashihara Karate earlier on, helped to find space the training space- on the roof garden of the hotel where he ran his Japanese restaurant. Vincent started out with slightly more than 20 students then, half of whom were new to karate. A second dojo was later set up in Safra Bukit Merah. At its peak, Ashihara Kaikan Singapore had 12 dojos around the country. It was also involved in sports karate. “Some of the members wanted to try out sports karate, so I let them. They had good results too,” says Vincent. Things Today - And Where to Next? Vincent says he tries to make the training in Singapore close to how it is done in the headquarters in Japan. But there are inevitably some differences. “The behavior of the students is a bit different. For one thing, the students in Japan are very disciplined. When the juniors, kids, come into the dojo, they stand in their positions and do their own thing. Very disciplined, very quiet,” he observed. ​He hopes karate gets more recognition in Singapore, such as having a bigger presence in public events and overseas sporting competitions. To draw more students, Vincent believes Ashihara Kaikan must focus on its strong points- the emphasis on safety and logic.